Pra Somdej Pim 13 Chan Hlang Yant Ongk Kroo Takrut Tong Kam + Takrut Ngern Tae , made from Sacred Pollens and 'Pong Lob' Yantra Powders with Monks Hair. 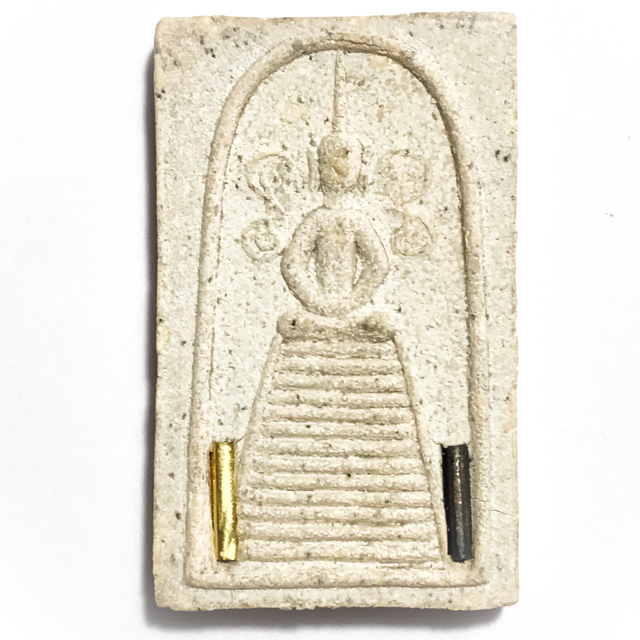 This Buddha Image Votive Tablet with Solid Gold Takrut insert, was released in Traimas Blessing in 2537 BE, after a whle three month rainy retreat of nightly empowerment sessions by Luang Por Yid. This amulet is in exceptional condition and has been kept in excellent form, and has very clear features. This model is one ov a very few Ongk Kroo models made with solid gold Takrut and solid silver Takrut inserted either side of the Dais upon which the Buddha sits. The word 'Ongk Kroo' means something like 'teacher amulet' , but the term is also used for the top models of an edition too. This Pra Somdej 13 Chan Traimas Edition 2537 BE Amulet is in every sense an Ongk Kroo in both senses of the word, being a top model of its edition and series with Gold and Silver Takrut. The amulet is in perfect condition and with easily recognisable authentic features, the amulet is also a perfect reference study material for teaching oneself to recognise the authenticity factors of Pra Somdej LP Yid amulets. For this reason, this amulet can be considered an exceptionally attractive example, worthy of serious collection, diligent study, and the highest reverence. The rear face of the amulet bears two different Sacred Yant spells embossed, and the words 'Luang Por Yid Wat Nong Jork' embossed on the bottom of the rear face. The front face features a most classic and in pristine appearance image of the Buddha in the classic style of a Somdej Hoo Bai Sri long eared Buddha (siimilar to those seen from Wast Gaes Chaiyo), with angled elbows, and a long pointed topknot which touches the rim of the arch above the Buddha's head.. The Buddha is seated on a 13 tiered dais, and a pair of solid gold and solid silver takrut are inserted into the bottom part of the dais, empowered with Buddhist prayers and Incantations from Luang Por Yid, and other monks present at the Buddha Abhiseka Blessing Ceremony. A small Sacred Na spell is embossed either side of the head and shoulders of the Buddha. The Buddha sits on a high Dais, which has a total of thirteen tiers. The base of the Dais is flanked with one solid gold Takrut, and one solid silver Takrut inserted into the Sacred Muan Sarn powders of the front face of the Votive Tablet. The rear face features Sacred Na (Yant) spell inscriptions for Metta Mahaniyom Mercy Charm. Below that, is the name of Luang Por Yid and the Temple. 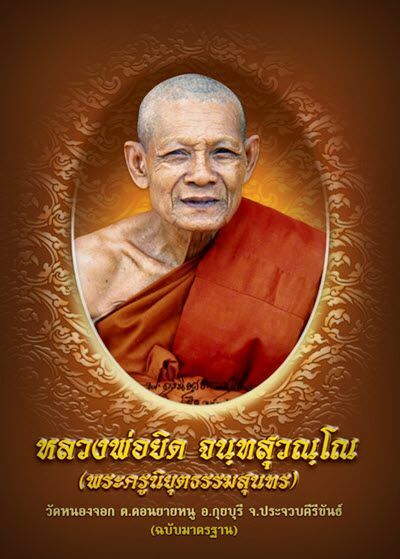 Luang Por Yid made a great many amulets in his pantheon, but was most famous for his powerful Palad Khik amulets. Luang Por was famous for being able to chant and empower Palad Khik to the point where they stand up and dance around of their own accord, and has been seen to do this a hundred times or more with devotees witnessing the event. One of Luang Por Yids close devotees, Ajarn Chaiya Am Sam Aang, who assisted him during his years as an ordained monk at the side of Luang Por Yid, and who published the book of Luang Por Yid's Biography and catalogue of the Dtamra of his amulets, tells that he saw many occurrences of miraculous events as he was resident at Wat Nong Jork assisting Luang Por Yid. successfully empowered them with great Kong Grapan Chadtri and Klaew Klaad Evasion Magic Powers. Both Luang Por Phaew and Luang Por Yid's amulets are hence seen as equally powerful as protective amulets, in addition to the obvious Maha Sanaeh and Maha Lap Powers that are attributed to Palad Khik amulets. Before the day he was to leave, at around 2 a.m. in the morning, hje heard some loud noises coming from Luang Por's Kuti Hut room, which sounded like a cat catching mice. So he decided he would get up and go have a look, but when he tried to get out of bed, he was frozen paralysed rather like he was being smothered by the 'Phii Am'. 'Phii Am', is an effect where you wake up, and cannot move and are completely paralysed, which Thai people blame on a kind of ghost that smothers you by sitting on top of you in the bed). Ajarn Chaiya says that it sounds incredible to believe when one hears that a Palad Khik can jump around of its own accord in the hand, and that one might think that it is a fictional story, and that Luang Por was using a trick or technique with is hand. But Ajarn Chaiya tells that the Palad Khik wold even still jump around when placed on the 'Pan Kroo' tray that was placed at a distance from Luang Por Yid.